you can download this indicator from mql5 site directly. Its ATR value of all multiple instruments of multiple time frames. It does not provide buy sell signal, its for checking market volatility. Introducing one and only metatrader free ATR Dashboard indicator which shows ATR value for multiple instruments for multiple timeframes simultaniously. Check market volatility at a glance. For a day trader, it is not always possible to observe all currency pairs or indices, trading instrument one at a time. This tool helps the trader to spot market volatility across all instrument at glance. A day trader can decide which currency pair to choose for trading, which one is moving slower & which one is moving faster. As we all know during forex news release, the market creates a volatility, random sharp movement. With this ATR (average true range) dashboard you can view how different currency pairs are reacting during the news release. You can edit and choose different instruments, also the ATR period of different time frame. Suitable for all types of time frame metatrader supports. Can be used for all of types of trading, Scalping to Position trading. All types of trading instrument, including forex pairs, commodity market, metal & indices. ATR (Average True Range) is an Oscillator, part of the technical analysis which shows the volatility of the market. How many pips or points market movement per candlesticks or bar. Under a certain time, what is the average movement of the market. This indicator helps a lot to understand where a forex trader should place his or her stop loss. Also where to put the take profit of the trade. For a day trader daily ATR level can be very useful to gauge possible market movement. If a trader bought EURUSD & planning to hold it for 1 hour. If from the ATR dashboard 60 minutes ATR shows 19, that indicates, the trader should averagely expect 19 pips profit out this trade under 60 minutes. The indicator has an option where the trader can use it for the current chart only. A single option which saves time. See the picture the below for better understanding. Setting the below option true will show the ATR data for current chart. Suppots all timeframe which metatrader has. 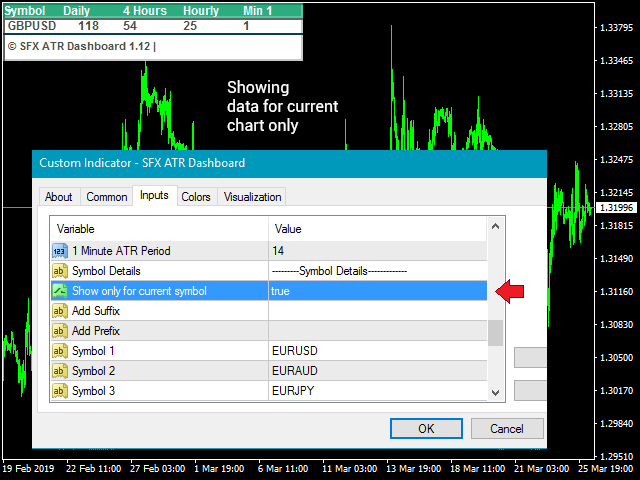 You can select upto 4 timeframes one at time to display ATR value accross different forex pairs or instruments.